Michigan State has announced the signings of five players for the start of the 2017-18 season. Michigan natives Tommy Apap (Youngstown Phantoms/USHL), Austin Kamer (Lone Star Brahmas/NAHL) and Brody Stevens (Green Bay Gamblers/USHL) are joined by two other players for the Spartans’ latest class; MSU had previously announced the signings of three players in the fall. The two non-Michigan natives are forwards Gianluca Esteves (Aston Rebels/NAHL), a native of Winnipeg, and Jake Smith (Chilliwack Chiefs/BCHL), a native of East Amherst, N.Y. They join previously signed players Tommy Miller (NTDP/USHL), Mitch Lewandowski (Chicago Steel/USHL) and David Keefer (Des Moines Buccaneers/USHL). Scouting Report: Mature and physical player who brings outstanding leadership … Served as a captain in Youngstown and did an outstanding job leading the team into the playoffs and to a near upset of the eventual USHL champions … Brings size and strength to the lineup and will be a huge asset in the faceoff circle. Played his second USHL season with the Youngstown Phantoms in 2016-17, recording 20 points (4g, 16a) in 58 regular-season games, while adding a goal in five playoff contests … Made his USHL debut with the Fargo Force in 2015-16 and played 14 games with the club before being dealt to Youngstown where he had 15 points (4g, 11a) in 38 games … Put up 39 points (13g, 26a) in 57 regular-season games with the Wichita Falls Wildcats of the NAHL in 2014-15 and then added three goals and three assists in six playoff games … Played three seasons for University of Detroit Jesuit High School, his best year coming in 2013-14 where he had 63 points (14g, 49a) in 29 games. 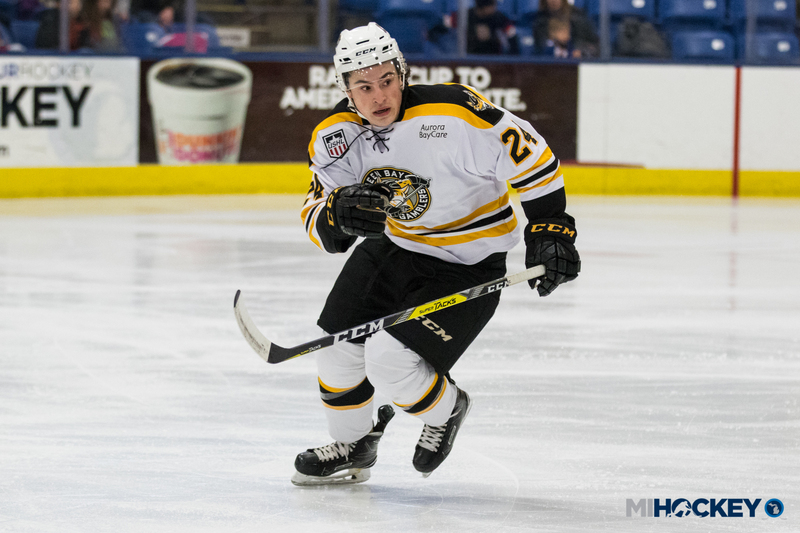 Scouting Report: Has excellent speed, allowing him the ability to make plays offensively and defensively … Excelled in the 2017 NAHL playoffs, getting points at big times in games to help Aston get to the Robertson Cup … Leadership and experience will help the lineup immediately. Put up 45 points (17g, 28a) in 60 regular-season games for the Aston Rebels in his first season in the NAHL … Helped lead the Rebels to the NAHL Robertson Cup Finals, recording 9 points (5g, 4a) in 12 playoff games … Played two seasons for the Winnipeg Blues of the MJHL, registering 26 points (14g, 12a) in 52 games in 2014-15 and then 39 points (12g, 27a) in 56 games the following year … Played AAA hockey for the Winnipeg Wild in 2013-14 where he had 52 points (21g, 31a) in 44 contests. Scouting Report: Very smart player that has the ability to make plays and make others around him better … Part of the NAHL Roberstson Cup champions and scored the game-winning goal in the final game … Has a high hockey IQ and will increase competition in the lineup. Recorded 43 points (17g, 26a) in 57 games for the Lone Star Brahmas in the NAHL … Represented the South Division at the NAHL Top Prospects Tournament, where he registered a goal and an assist in two games … Had 8 points (2g, 6a) in 11 playoff games in helping lead the Brahmas to the NAHL’s Robertson Cup … Served as an alternate captain in 2016-17 … Played two seasons with the Powell River Kings of the BCHL, recording 11 points (3g, 8a) in 40 regular-season games in 2014-15, and then 34 points (18g, 16a) in 55 games in 2015-16 … Played for the Belle Tire organization from 2009-12 before being a part of the Cleveland Barons U18 team for two seasons from 2012-14 … Registered 39 points (19g, 20a) in 37 games for the Barons in 2013-14. Scouting Report: Had two great years in Chilliwack, including helping lead the team deep into the playoffs this past season … Very smart player and very physically fit, which has translated into success on the ice … Extremely versatile with the ability to help in many ways … Outstanding leader who brings maturity and excellent work ethic. Played the last two seasons for the Chilliwack Chiefs in the BCHL … Averaged a point-per-game in the 2016-17 regular season, registering 58 points (32g, 26a) in 58 games to rank third on the team … Produced 17 points (6g, 11a) in 23 playoff games for the Chiefs, including a five-game point streak over which he recorded 8 points (3g, 5a) … Compiled a 14-game point streak during the regular season, generating 27 points (13g, 14a) … Had 25 points (8g, 17a) in 58 regular-season games in his first season with Chilliwack in 2015-16 … Played 31 games for both Choate Rosemary Hall in Connecticut and the Connecticut Wolf Pack U-18s in 2014-15, producing 18 points (1g, 17a) and 19 points (12g, 7a), respectively … Played three seasons for the Nichols School in Buffalo, N.Y., from 2011-14. Scouting Report: Had very good year with Green Bay last year and plays a very heavy game, while also possessing the ability to add offense …. Spent a lot of time with the NTDP two years ago and did an excellent job providing spark and leadership … His energy and competitiveness is contagious and will be a large component of driving our enthusiasm. Recorded 28 points (12g, 16a) for the Green Bay Gamblers in his third full season in the USHL in 2016-17 … Led Green Bay with 134 penalty minutes … Split the 2015-16 season with the Fargo Force and Madison Capitols, playing 25 games with Fargo (5g, 8a) and then 11 with Madison (4g, 3a) … Put up 35 points (15g, 20a) in 58 games for Fargo in 2014-15 in his first full USHL season … Was a reserve member of the USNTDP in 2013-14, recording 12 points (8g, 4a) in 49 games … Also played 20 games for Victory Honda U18 and two games for the Fargo Force in 2013-14 … Played for Compuware from 2010-13.